Marrakech, also called the red city, is the number one destination to visit in Morocco. Each year, this fabulous city attracts numerous tourist form all over the world. 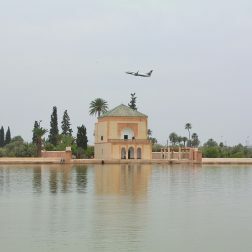 Visitors are overwhelmed by all the wonderful impressions and by the wide range of things to do and to see in Marrakech. The North African city is home to some vivid medinas, colourful souks, mysterious snake charmers, mint tea and numerous top-rated tourist attractions. All in all, a perfect place to spend an unforgettable time in Morocco. In this blog we are going to tell you more about the best things to do in Marrakech, the best sights and the top excursions around. 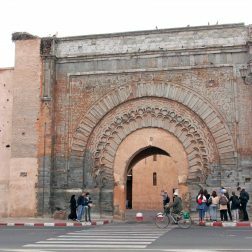 The El Badi Palace, a ruined palace is located inside the Medina of Marrakesh. It was built 15 years from 1578 – 1593 and the name of the palace means the “the incomparable place”. Today visitors have the possibility to visit the ancient ruins and imagin how amazingly beautiful this palace must have been. Colonnades out of marble, expensive materials like gold, a central pool and 360 very rich decorated rooms – in any case, the palace must had been impressive in former times. 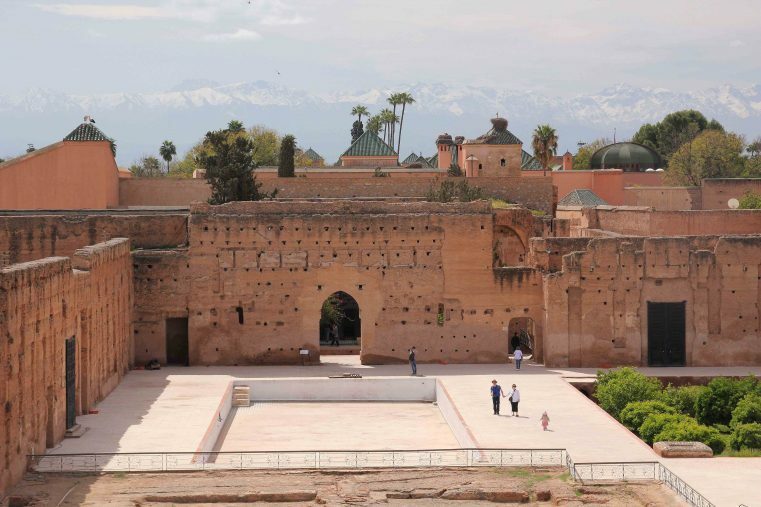 The El Badi Palace is a pretty impressive historical site and one of the best sights of Marrakech. The Majorellen Garden, also called Jardin Majorelle, is a hauntingly beautiful botanic garden created by the orientalist artist Jacques Majorelle in 1923. 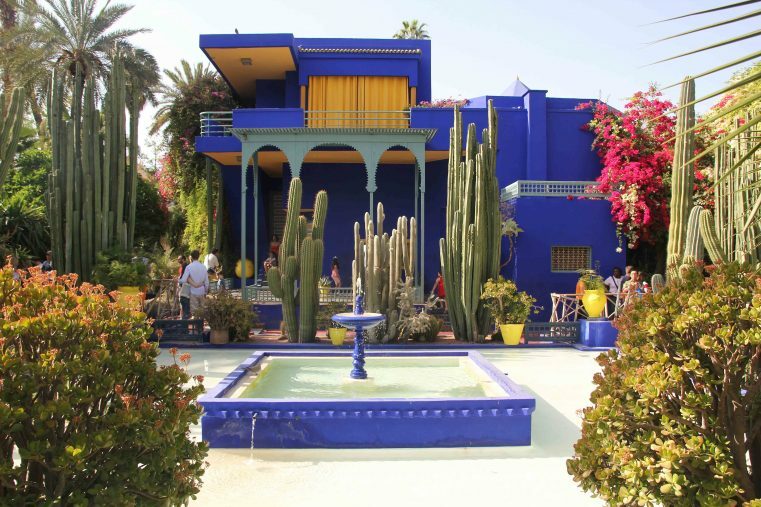 Back in the 1980 the famous designer Yves Saint-Laurent restored the gardens and today the Jardin Majorelle is known as one of the most impressive sights in Marrakech. The Garden and the Villa can be visited daily and because of its outstanding scenery the Majorelle Gardens are really popular among tourists. 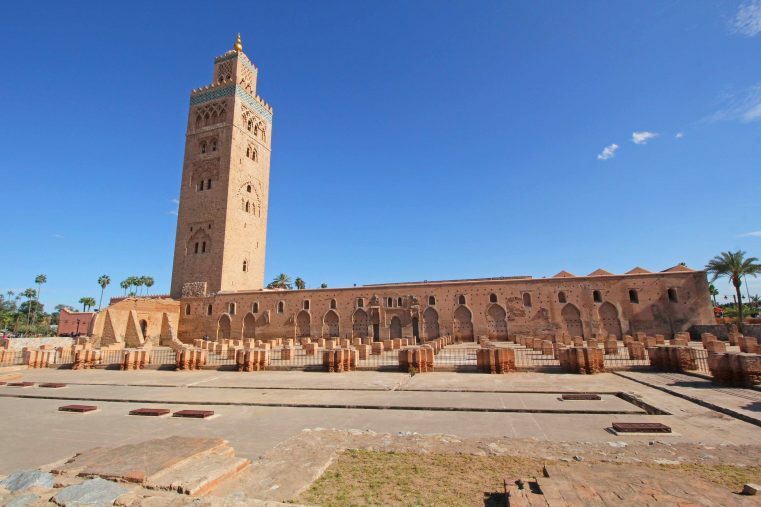 The Koutoubia Mosque’s minaret is an astounding 77 meters high and so it’s the largest mosque in Marrakech. Visiting the mosque inside is only allowed to believers. Anyway, the Koutoubia mosque which is built out of red stone is a real eye-catcher and the beautiful rose gardens around are inviting for a break. The Djemaa el-Fna is the most popular market square in Marrakech and is as old as the city itself. All the storytellers, water sellers, snake charmers and dancers make a visit to that place a unique Moroccan holiday experience. Our tip: Enjoy a cup of mint tea at the terrace of a rooftop café and watch the hustle and bustle from above. In the evening the Djamaa el-Fna gets filled with numerous foods stalls and both locals and tourists love eating out there. 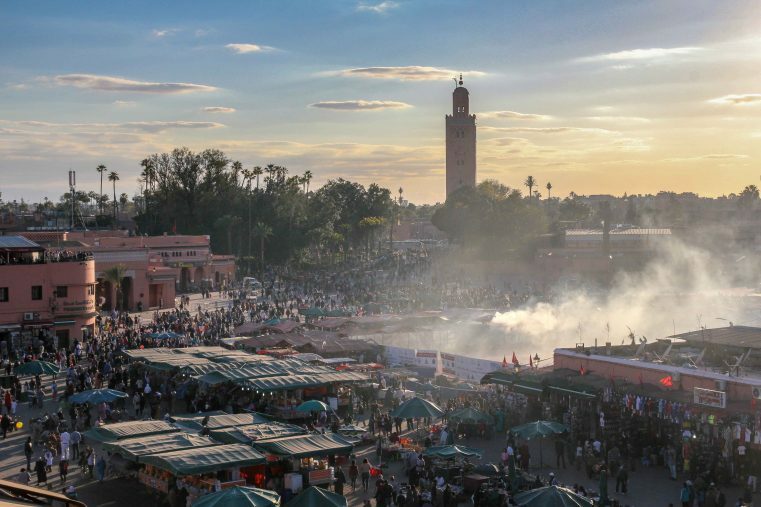 Visiting the Djemaa el-Fna promises a unique experience and is definitely one of the top things to do in Marrakech. No trip to Marrakech is complete without getting lost in the huge medina, the old fortified city which is a labyrinth of narrow streets. Surely, you will explore something new behind each corner. Also, the popular Souks (markets) are located inside of the medina. 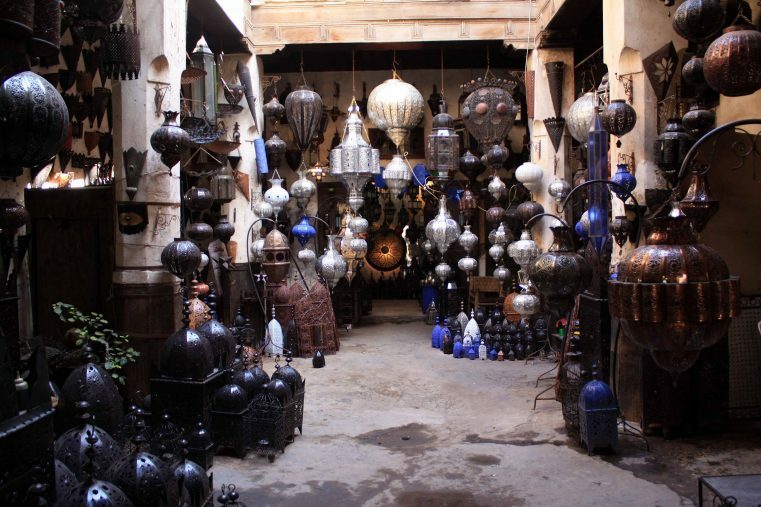 They offer it all from spices, fruits and vegetables, to antiques, wools and silks, crafts and Moroccan lanterns. Here more about Shopping in Morocco! The Bahai Palace is drop-dead gorgeous and shouldn`t be missed in any case! 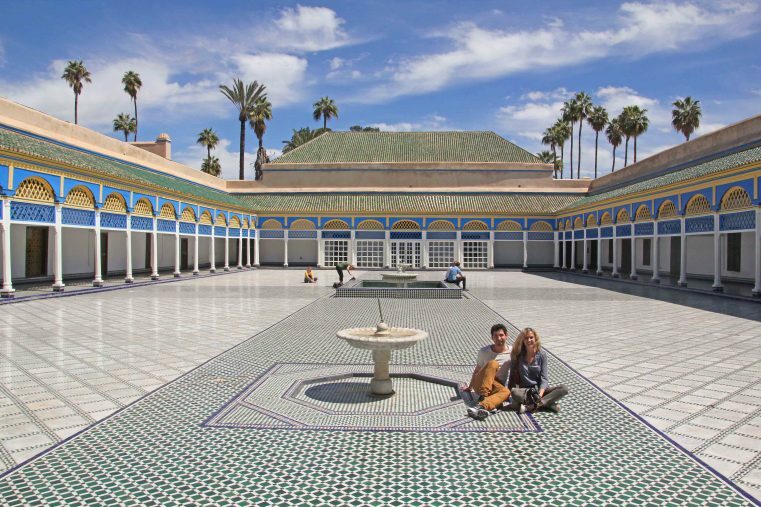 No wonder that the palace is also called the “brilliance”: The complex contains an 8000 m2 large Moroccan styled garden, a gorgeous colourful court with a central basin and surrounding palace rooms with decorated columns, wonderful mosaics and decorated ceilings. Definitely a must see in Marrakech! The Medersa Ben Youssef was an Islamic college and one of the largest Medersas all over Morocco. 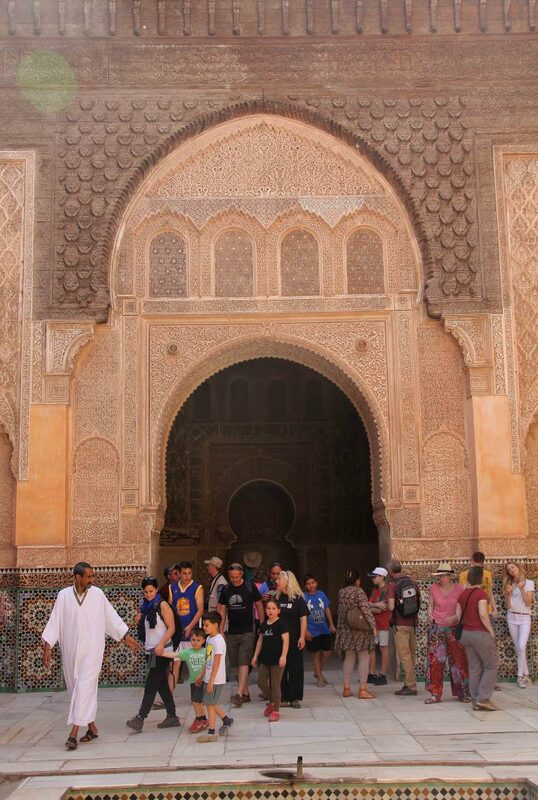 Tall arches, a fine open-courtyard and carvings and mosaics makes the Medersa really awe-inspiring. The more than beautifully detailed architecture makes the Medersa Ben Youssef one of the top places to visit in Marrakech. -Menara Garden: The Menara Garden, also named Jardin Menara is located outside of the Medina. Take a walk around the basin and enjoy the wonderful scenery. -House of Photography in Marrakech: The Maison de la Photographie is a photo museum that is located inside a beautiful riad and exhibits photography from the earlier days. 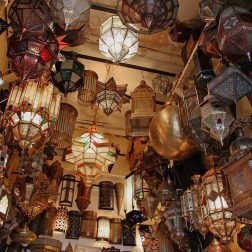 -Place des Ferblantiers: Located in the heart of the Mellah, this beautiful square is popular for its unique Moroccan lamps. -Saadian Tombs: Saadian Tombs are one of the most best preserved final resting places in Morocco. -Bab Agnaou: Is one of the 19 gates in the south of the Medina. -Marrakech with kids? Check out here what to do if you are in Marrakech with Kids. -Here is a list of the 9 most Instagrammable spots in Marrakech!